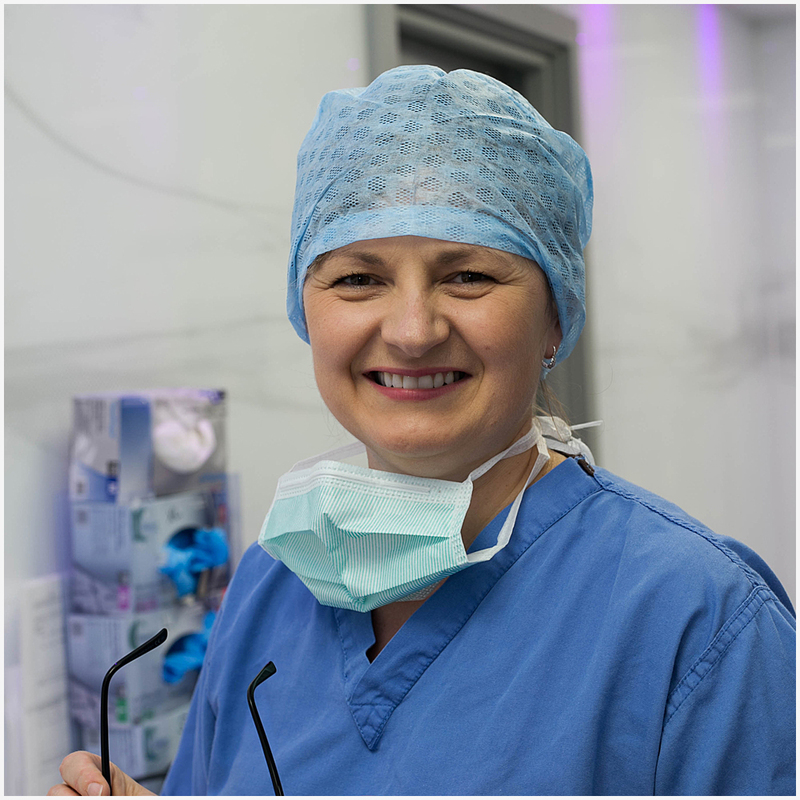 Ms Anna Moon is a highly qualified Consultant Hand Surgeon who has been based in the Worcestershire and Warwickshire region since 2005. Anna took the decision to leave the Worcestershire NHS Trust in 2016 to enable her to focus on specialist hand treatment tailored to the needs of the individual. This decision ensures a truly customer focused service with the individual patient needs at the forefront of everything she does. She wrote her PhD Thesis on microsurgical techniques in hand surgery. During her career she has trained extensively across Europe with specialists in hand surgery and microsurgery and performed more than one hundred replantations (microsurgical re-attachment of amputated hands and fingers). During her eighteen month sabbatical at a hospital in Abu Dhabi, United Arab Emirates, Ms Moon worked with plastic surgeons on complex hand injuries including microsurgery. She routinely performs a range of procedures including Xiapex injection for dupuytren's contracture, tendon and ligament repair, microsurgical nerve repair, dupuytren's fasciectomy, carpal tunnel release, bone fixation and wrist arthroscopy. She has presented and run courses at many national and international forums and published articles in Orthopaedic journals. Anna was also recently appointed as a Visiting Senior Lecturer at Aston University. Ms Anna Moon is married to Nick Moon, a company director. They have eleven year old twins, Sophie and Charlie and Rosie who is nine. When not working, Ms Moon enjoys walking, gardening, cooking and outdoor living such as cycling and skiing. * Results from the GMC revalidation process. View or Download patient feedback report here. View or Download colleague feedback report here. Cultivated autologous osteoblasts and chondrocytes in the treatment of non-union and chondral defects. The expression of vascular endothelial growth factor (VEGF) in human periosteum in response to fracture. Is pattern of VEGF staining different in the avascular fracture part of displaced intra-capsular farctures neck of femor? Participation in the study to find out the genetic basis Of Dupuytren’s disease. The effect of reconstructive surgery of the hand on the length of recovery after hand injury. Scerbakova A∗ ,Vasko G, Stasko I.
Reconstructive hand surgery – a five year review. Central European Meeting of Orthopaedic Surgeons, Bratislava, Slovakia, January 1996. Scerbakova A∗, Vesely J, Stasko I, Vasko G.
Reconstructive operations after loss injury of the soft tissue of the foot. International Symposium on Hand Surgery,Tabor, Czech Republic, November 1997. Free vascularized bone graft for bridging large bone defect after resection of tumour of the tibia. Case report. Vesely J,Scerbakova A∗, Vasko G.
The role of microsurgery in Orthopaedic Surgery. Scerbakova A∗, Sekac J, Bielek J, Hunar M.
Toe to hand transfer - Morrison around flap. Scerbakova A∗, Vasko G., Sidor Z. Evaluation of replantations with regard to duration of treatment and sick leave. Surgical management of aseptic bone necrosis. 8th Orthopaedic Conference, Hradec Kralove, Czech Republic,October 1999. Vasko G, Scerbakova A∗, Svihla R.
Annual meeting of the Czech Society of Orthopaedic Surgeons, Karlovy Vary, Czech Republic,1999. Kralikova L, Scerbakova A∗, Filka V, Kalnasova B. Use of local anaesthetics in microsurgery of the hand. 6th meeting of the Slovakian Society of Anaesthesiology, Kosice,1999. Prophylactic use of antibiotics in Orthopaedic Surgery. Contemporary outlook at femoral head avascular necrosis. Part I & II. Slovensky lekar,10,(24) rocnik, No.3-4: 104-109; 2000. Our experience with autologous osteoblasts and chondrocytes preparation for therapeutic use. Scerbakova A∗, Vesely J, Sekac J, Totkovic R, Vasko G.
International Meeting on Hand Surgery, November 2001, Brno, Czech Republic. Rosocha J, Vasko G, Bacenkova D, Hrbkova H, Svihla R, Varga G, Jenca A, Cellar R, Bobak L, Kladekova Z, Bielek J, Scerbakova A∗, Nemec P.
Preliminary clinical experience with the preparation and therapeutic use of autologous osteoblasts and chondrocytes. Cell nad Tissue Banking 3: 127-132, 2002 Scerbakova A∗, Bourke H, Sandison A, Hughes S P F, Reichert I. Is our hand trauma service hitting the British Society for Surgery of the Hand (BSSH) guidelines? Are the BSSH guidelines achievable? British Society For Surgery Of The Hand (BSSH): Are The Waiting Time Guidelines For Hand Trauma Achievable?